For the sixth year, our dining editor selects Georgia’s 10 best restaurants, pays homage to topflight dining experiences throughout the state, and points her fork in the direction of some exciting vacation spot meals. Once known best for great Mom-and-Pop and barbecue joints, Georgia has, in the last few decades, earned the restaurant industry’s highest honors for its fine dining and homegrown artistry. Among the missing: Guenter Seeger, the city’s critical favorite (and the man many diners loved to hate), and Sotohiro Kosugi, who recently re-emerged with a new restaurant in New York City’s Greenwich Village, a year after shuttering the beloved, sushi-as-art Soto. As I write, Joël Antunes prepares to re-open his renowned namesake restaurant after a significant downsizing. Still, new talents continue to brighten the dining scene, even in out-of-the-way nooks like Wilmington Island, where chef/owner Michele Jemison brings her Santa Fe experience to Red Door. This is the place to feel coddled and cosseted. Claude Guillaume seems as confident and creative in the management of the superlative service as chef Arnaud Berthelier is of his Mediterranean-tinged menu. 3434 Peachtree Road NE, Buckhead. 404-240-7035. 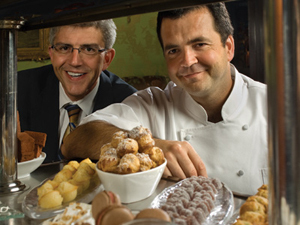 Executive chef Robert Gerstenecker and pastry chef David Jeffries are a formidable team, and the kitchen’s “chef’s table” is the best around. Park 75 also offers the state’s most extravagant dinner: The $1000 per couple Louvre dinner, which comes with French-themed custom dishes, wines and a private, after-hours tour of the High Museum’s ongoing Louvre exhibit. 75 14th St., 404-253-3840. Chef Hugh Acheson’s quirky but laser-focused college town favorite is a prerequisite for an Athens visit. 1653 South Lumpkin St., 706-546-7300. Kevin Rathbun is in an expansive mood, adding Rath-bun’s Steak to his noisily toothsome home base. 112 Krog St. (in the Stove Works), 404-524-8280. It’s somehow easy to take this graceful grand dame for granted, but former employees Greg and Gary Butch have expertly escorted her into a solidly successful post-Elizabeth Terry era. 105 E. 37th St., 912-236-5547. Authentic without being tradition-bound, Marco remains our favorite Macon mainstay. 4581 Forsyth Road, 478-405-5660. Our favorite getaway inn also serves some of the state’s best food – but when will local politicos allow Glen-Ella to showcase Georgia’s booming wine industry? 1789 Bear Gap Road, 706-754-7295. Christie is the wife of this husband-and-wife team effort, which continues to make Brunswick a dining destination when you’re staying in Jekyll or St. Simons. The food is as innovative as the couple is young. 1618 Newcastle St., 912-262-0699. Near-worshipful dedication to the finest Southern ingredients, in fresh new combinations. 2277 Peachtree Road (in the Aramont), 404-355-0321. Atlanta’s most exciting new restaurant is sometimes hard on the eardrums, but the food (such as the deliciously deconstructed oysters Rockefeller) encourages the party atmosphere. 1198 Howell Mill Road, 404-355-2252. Husband-and-wife owner/chefs Joseph Truex and Mihoko Obunai earned a place on Esquire’s Best New Restaurants of 2006 list, and despite the seemingly gimmicky dishes (foie gras hot dogs, anyone? ), Repast is adult in all the right ways. 620 N. Glen Iris Drive (at North Avenue), 404-870-8707. A cut above the ordinary neighborhood restaurant it first appears to be, Nazzaro has an extensive wine list, friendly staff and surprisingly creative specials that make it worth repeat visits. 196 Retreat Village, 912-634-6161. It’s a little surprising that it took this long for a restaurant that seems such a perfect fit to take its place in Athens, but this is a welcome entry, offering fresh ingredients from its own and others’ nearby farms in a contemporary context and environment. 255 W. Washington St., 706-549-4660. We’re glad the James Beard Foundation re-confirmed what we’ve always known: That Edna Lewis protégée Scott Peacock’s heartfelt iteration of the Southern vernacular, expressed in pigeon peas and pimiento cheese, is as worthy of its highest honor as any of the Southeast’s finest restaurants. 406 W. Ponce de Leon Ave., 404-378-4900. From the architecture to the entreés, Local 11 Ten sets itself apart from the usual exposed-brick Savannah bistro. If the desserts become as good as everything else here, this restaurant will be a serious contender. 1110 Bull St., 912-790-9000. Strangely, few St. Simons restaurants offer a waterfront view, so this new marina-based entry from the owners of Atlanta’s Food 101 is a welcome addition to the scene. Golden Isle Marina at 102 Marina Drive, 912-638-7790. Finally! Another exciting restaurant downtown – with seriously good French food. FAB fits the bill on every count, from old-school cocktails and aproned wait staff to the butter-browned skate, in this reincarnation of Brasserie Le Coze. 30 Ivan Allen Jr. Blvd., 404-266-1440. The kind of place you never knew you needed, but once tried, becomes indispensable. Always friendly and low-key, even when crowded, this little pizza parlor with a sense of humor offers handmade guacamole, excellent crab cakes, huge salads and some of the best fish specials around (recently: halibut simmered in Guinness). A new location recently opened in Tucker. 2884-B North Druid Hills Road. 404-315-6262. Prodigal son Derek Morgan returned home to install this beautifully simple restaurant in downtown Cartersville. A frequent guest chef at New York’s James Beard House, Morgan also loves beautifully simple food, limiting each dish to a few ingredients. The combinations (lobster bisque with porcini essence; seared ahi tuna with scallion hummus) are unusual, entertaining – and delicious. 28 West Main St., 770-383-3535. Pano Karatassos’ empire stretches from the fashion-forward Bluepointe to the stolidly classic Pano’s & Paul’s. My favorite is this tribute to his homeland, Greece, and its lifeline, the sea. The fish is flown in from around the world, and cooked on a wood-fired grill. But I also love the vegetables, as well as the expert wait staff and an atmosphere that promotes intimate conversations. 3085 Piedmont Road, 404-262-0702. Brothers Alex and Chris Kinjo’s self-designed spot (like their equally imaginative and culinarily solid Vietnamese restaurant, Nam) tops the heap for its genre. 265 Ponce De Leon Ave., 404-815-8844. Chef Michael Tuohy’s California aesthetic works nicely with local, seasonal ingredients, and fresh pizzas from the roaring, wood-burning stove. The wine list is as singular as the ingredients. 1782 Cheshire Bridge Road, 404-347-9055. Whatever the dining conundrum (“Where can we eat after going to the symphony?” “Where can we go that has interesting food – but will also cater to culinary conservatives?” “Who has a nice bar, an interesting wine list and a table where we can talk?”), I usually end up suggesting this underrated, Southern-accented, utility infielder. 471 N. Highland Ave. NE, 404-525-3363. St. Simons’ best restaurant is the dream of two Culinary Institute grads, its chef/owners. Quiet and dignified without fussy formality, the Georgia Sea Grille is a welcome respite from noisy Village eateries – I wish only for a stronger wine list. 310 Mallory St., 912-638-1197. The country music is raucous – and just as real as the lip-smacking, wood-smoked barbecue in a wood shack in historic Roswell. 1072 Green St., 678-352-1975. Let others fight the lines at Taqueria del Sol – I’ll take this uncrowded, sit-down restaurant with a full bar and inventive Mexican-style desserts. In addition to soft tacos and corn-and-shrimp chowder, the restaurant has the best tamales in town, handmade by Mama Ballesteros (available on Saturdays only). 4418 Hugh Howell Road, 678-937-0660. Two enterprising UGA grads have lovingly re-created the Normaltown legend, which opened in 1955 and closed in 2003. This new, nearby spot duplicates everything but the nicotine-tinged walls, and the burgers are delightfully, authentically greasy. However, you can also get good salads and vegetables along with your PBR, or even (shudder) a glass of chardonnay. Be sure to check out the framed photos of Allen’s regulars, and the hilariously upscale bathrooms. 810 Hawthorne Ave., 706-353-6244. The Five & Ten’s Hugh Acheson owns this adjunct to Athens’ new arthouse cinema, Ciné, and one of his former sous-chefs is cooking. With its sweet, tiny bar and sunlight-flooded dining room, this recycled tire recapping plant is a welcome addition for lunch – we can’t wait to try the Mediterranean-inspired “snackies,” hangar steak, halibut and seafood fideos at dinner. 232 West Hancock Ave., 706-549-3450. Chef/Owner Michele Jemison offers an escape from the usual seafood extravaganzas with creative Southwestern cuisine that also includes a few Southeastern-influenced items, like coffee-crusted pork loin over sweet potato purée, with a tangle of sautéed Swiss chard. 4A Wilmington Island Road, 912-897-4488. This new adjunct to Palm Coast Coffee serves up really good, 12-hour smoked ’cue in a hip atmosphere constructed entirely of umbrellas, tarps and old signs. 318 Mallory St., 912-634-7516; 2020 Demere Road. This little mountain-town coffee shop that could offers fair-trade coffee and local wines, along with healthy, fresh sandwiches and salads – and the vibe of a smart, concerned and growing community. There’s now more room on the shady patio out back. 42 E. Savannah St., 706-212-0020. Callaway’s newest restaurant entry is carved from the former clubhouse, and focuses on Georgia-themed offerings. 17800 U.S. Highway 27, 706-663-2281. The grand, newly renovated and redesigned Cloister’s Georgian Room immediately earned a place among Esquire’s best new restaurants of 2006. Also, former Nikolai’s Roof chef Johannes Klapdohr has signed on as executive chef at the Lodge, which features such old-school favorites as the Colt & Alison steakhouse. 888-732-4752, ext 4347.